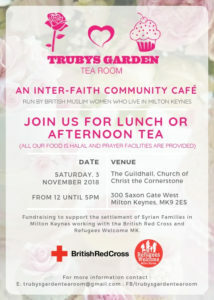 As usual we will be serving our delicious home made lunches and afternoon tea in support of our continuing efforts to fundraise to enable the settlement of Syrian refugee families in Milton Keynes working in partnership with the British Red Cross and Refugees Welcome MK. With the grace of God we successfully achieved our target of £3k to support the settlement of the families who arrived in September – a BIG thanks to everyone who helped including the One World Concert Team and St Edwards Catholic Church’s event team. With their support we were able to achieve our target with flying colours!!! 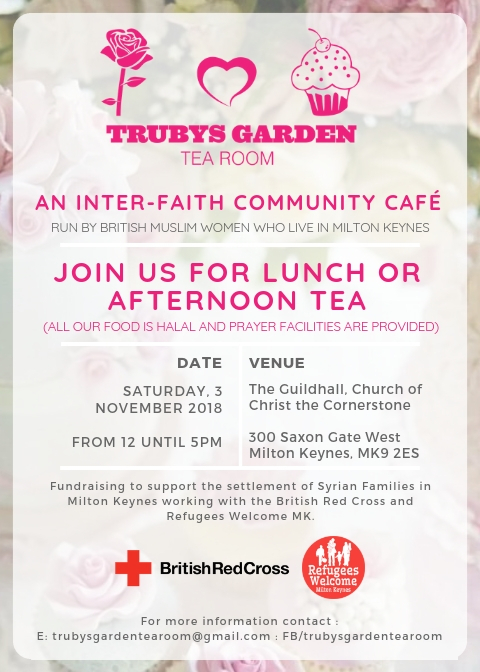 Our next few events will now focus on fundraising for the next group of families arriving in January 2019 and support services needed by the families settled in MK already.